Fear of the decomposing corpse reached a fever pitch, and cities and towns passed laws banning human burials within their borders. This marked the beginning of sanitizing death and the beginning of a funeral industry that today rakes in $16 billion annually in the U.S. alone. But we’re starting to see a backlash to these modern-day burial methods as the idea of green burial is gaining momentum in the United States once again. What is a green burial service? Also known as “natural burial,” the Green Burial Council describes a green burial as something that. Basically it is returning the body back to the earth in its natural form to decompose naturally with bugs and all that stuff. Hybrid. These burial sites are generally conventional cemeteries that offer a “green” section, allowing for the burial of umembalmed bodies in biodegradable caskets or shrouds. The cemetery may still allow the use of pesticides, turf lawn and non-native plants. Natural burial grounds. Only unembalmed bodies are buried at these sites. Toxic chemicals, cement and metal vaults, traditional marble/stone grave markets and caskets made of non-biodegradable materials are banned. These burial sites also implement waste-reducing and energy-conserving guidelines to improve sustainability. Conservation burial sites. This is the gold standard green burial if you’re looking to support land conservation. These burial grounds require an independent conservation group, like a land trust, to oversee the land. This ensures it will remain as a conservation easement or land permanently preserved in its natural state. Is it legal to have a natural burial? Yes, but not all cemeteries offer this option. Kinkaraco, a green funeral products company, keeps a state-by-state list of green cemeteries that do not require embalming, a grave liner or vault. Or course, lobbying your local cemetery to open a green section for natural burials is also an option to bring green services to your community. If you plan a burial on your private property, be sure to check state and local laws regarding who may fill out a death certificate and file it with the local registrar. If opting for a home funeral, you can choose to work with a home funeral-friendly funeral home to help prepare the body or you and family members can prepare the body with gentle soap and essential oils. Look for a home funeral guide from your state to help direct you through the legalities and options available. If you’re opting for a green burial, you’ll want to bypass coffin options offered in most conventional funeral homes. Natural burials commonly use a natural fiber bed sheet, biodegradable shroud, a pine, seagrass or wicker box, natural papier-mâché or even a cardboard box. The general idea is that it’s natural, untreated wood or organic fiber. That way, it’ll break down and enhance the soil, not harm it. You’ll want to avoid any stains, varnishes, paints or other finishes because they likely contain harmful chemicals. Stick to untreated. Many green burial sites also allow loved ones to bury cremated remains. Ashes after a cremation are inorganic bone fragments. You can grow a tree over the ashes, but they aren’t actually feeding the tree or soil. 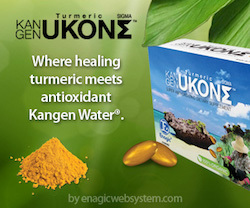 Business Opportunity – build a substantial income with Kangen water. This is an article about bottle water from a well known tv personality, Dr Axe. I have been writing about bottled water for some time and the dangers of drinking too much of it. I know a lot us (well I used to) buy flats of bottle water that would last us a week or so. ‘Not a good idea’. 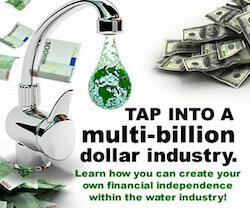 That is why I did a lot of research and found the Kangen Water Filter system to be the best on the market. Now they appear rather expensive but if you calculate the cost of bottled water over the years the filter is not expensive at all. First of all they are great quality and secondly the maintenance backup for these water filters are superior to any that I studied. I had been using filtered water via the jugs for many years but only to find they are not filtering a lot of the really harmful toxins in the water and because of the type of water you get from the Kangen filters there is absolutely no comparison. The average American drinks about 31 gallons of bottled water a year. Less than 30 percent of plastic water bottles are recycled. Bottled water is full of hormone-disrupting chemicals. Anti-estrogens and anti-androgens are present in the majority of bottled water. Estrogenicity in water from plastic bottles is three times higher compared to glass. Contamination of bottled water results in human exposure to endocrine disruptors. Bottled water risks include an increased cancer risk. A recent study found 11 out of 18 bottled water sampled induced estrogenic effects in a human cancer cell line. People in the U.S. buy half a billion bottles of water a week, more than enough to circle the globe 5 times. Laboratory testing conducted by Environmental Working Group found popular bottled water brands to contain mixtures of 38 different pollutants, including bacteria, fertilizer, Tylenol and industrial chemicals, some at levels no better than tap water. Some even contain high levels of cancer-causing chlorination byproducts. In the United States, 24 percent of bottled water sold is either Pepsi’s Aquafina or Coke’s Dasani. Both brands are bottled, purified municipal tap water. In the U.S., public water is regulated by the Environmental Protection Agency (EPA), which requires multiple daily tests for bacteria and makes results available to the public. The Food and Drug Administration, which regulates bottled water, only requires weekly testing and does not share its findings with the EPA or the public. According to the U.S. Centers for Disease Control and Prevention, some bottled water risks include fluoride exposure. Fluoride can occur naturally in source waters used for bottling or it can be added. Now that I have explained the reason why I have one of these machines I have to tell you there is a great business opportunity in selling them. I personally did not buy the machine because of the business but because I love the machine (now sleeping like a baby). The business is a bonus and trust me a good one. First of all, this is not multi-level marketing MLM; it is a direct sales program with a patented compensation plan. And the great thing is with our marketing system you can do it in just a few hours a day. Do yourself a favor and put 14 minutes aside and watch it. It could change your life for ever. 1. Which Kangen machine is best for your particular situation. 2. How you can get your machine for free! 3. 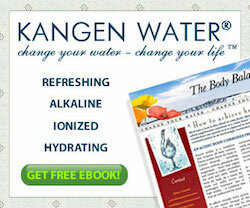 How to build a substantial income with Kangen water.